At Comic-Con 2015, fans of space opera and science fiction were treated to their first glimpse of The Expanse, the miniseries adaptation of Daniel Abraham and Ty Franck’s novels. Needless to say, the reaction was magnificent, and is perhaps best up by IO9’s Lauren Davis, who penned a review of the trailer titled, “The Expanse Is the Show We’ve Been Wanting Since Battlestar Galactica. It was therefore a bit of a blow when recently, the Syfy network announced that the third season (which is currently airing) would be the show’s last. Reaction to the news was swift, prompting fans to mount multiple campaigns to have the show picked up by Netflix, Amazon Prime, or another video streaming service. And on Friday, May 25th, Jeff Bezos (founder of Amazon and Blue Origin) obliged them. The announcement was made at the National Space Society’s International Space Development Conference in Los Angeles Friday night. Bezos was attending the conference to receive the prestigious Gerard K. O’Neill Memorial Award for Space Settlement Advocacy, thanks to his advancement of commercial space exploration through his company, Blue Origin. Bezos also took the opportunity to honor Gerard K. O’Neill, a physicist and well-known proponent of space colonization. Among the many ideas he proposed for creating settlements in space, the most-well known is arguably the concept of the O’Neill Cylinder (aka. O’Neill Colony). This would consist of two counter-rotating cylinders in space that would rotate to provide artificial gravity. It seems rather fitting that an entrepreneur who is dedicated to making science fiction a reality has chosen to renew a science fiction show. Clearly, Bezos is a fan, or perhaps he knows that fans of shows like The Expanse are also fans of his commercial space efforts. In either case, fans of the series are happy to know that there will be more seasons to come! There are many long rivers in the world, but which ones are the longest? Naturally, there is a disagreement over the answer to this question. While The Nile has traditionally been considered to be longest in the world, the Amazon has some pretty fierce defenders as well. The debate arises over the difficulty in determining the full extent of a river, and also because measurements differ according to who measured them. There are many factors in determining the precise length of a river. These include the source, the identification (or the definition) of the river’s mouth, and the scale of measurement when determining the river length between source and mouth. As a result, the length measurements of many rivers are only approximations. A river’s “true source” is considered to be the source of whichever tributary is farthest from the mouth, but this tributary may or may not have the same name as the main stem river. Furthermore, it is sometimes hard to state exactly where a river begins – especially rivers that are formed by ephemeral streams, swamps, or changing lakes. The mouth of a river is hard to determine in cases where the river has a large estuary that gradually widens and opens into the ocean. Some rivers do not have a mouth, and instead dwindle to very low water volume and disappear underground. A river may also have multiple channels, or anabranches, and it may not be clear how to measure the length through a lake. Seasonal and annual changes may alter rivers as well, not to mention cycles of erosion and flooding, dams, levees, and geological engineering. In addition, the length of meanders can change significantly over time when a new channel cuts across a narrow strip of land, bypassing a large river bend. The Nile River, located in Africa, is listed as being 6,853 kilometers (4,258 miles) long, and is hence commonly considered to be the longest river in the world. This river and its water resources are shared by eleven countries – Tanzania, Uganda, Rwanda, Burundi, Congo-Kinshasa, Kenya, Ethiopia, Eritrea, South Sudan, the Sudan and Egypt. In ancient times, its existence was closely tied to the rise of civilization in the Near East, being the main source of irrigation and fresh water for multiple Egyptian dynasties. Today, it remains the primary water source for both Egypt and the Sudan. The source of the Nile is traditionally considered to be Lake Victoria, but Victoria itself has feeder rivers of considerable size. It’s two main tributaries, are the White Nile and Blue Nile. The former is considered to be the headwaters and primary stream of the Nile itself, but the latter is the primary source of water and silt. The Amazon River is the longest river in South America, and the largest river in the world in terms of water discharge. This river has a series of major river systems in Colombia, Ecuador and Peru. At roughly 6,437 km (4,000 mi) in length, it is also considered to be the second-longest river in the world. However, Brazilian scientists claimed to have found the most distant source of the Amazon in the Andes. This source is apparently a glacial stream emanating from the peak of Nevado Mismi in the Peruvian Andes, roughly 700 km (430 mi) southeast of Lima. If this is correct, then the Amazon is in fact 6.800 kilometers (4,225 miles) long, making it the world’s longest. The third longest river in the world is the Yangtze – or as it’s known in China, the Chang Jiang River. The Yangtze is 6,380 kilometers (3,964 miles) in length, making it the longest river in Asia. It originates from the glaciers of the Qinghai-Tibet Plateau in Qinghai province, flows eastward across southwest, central and eastern China, and then empties into the East China Sea at Shanghai. The Yangtze River has played a large role in the history, culture and economy of China, and continues to do so to this day. In addition to running through multiple ecosystems in China, its existence was also pivotal to human settlement, the development of agriculture, and the rise of civilization in East Asia. Today, the prosperous Yangtze River Delta generates as much as 20% of China’s Gross Domestic Product (GDP), and the Three Gorges Dam – located on the Yangtze River near the town of Sandouping – is the largest hydro-electric power station in the world. Because of the impact of human infrastructure, some sections of the river are now protected wildlife preserves. At 6,275 kilometers (3,902 miles) the Mississippi-Missouri-Jefferson River system is the fourth longest in the world and the longest river in the United States. Although each river separately would not be in the top five, these three rivers are grouped together into one because the Missouri River meets the Mississippi near the city of St. Louis, while the Missouri connects to the Jefferson river in Montana. However, the main thrust of the Mississippi runs north-south, rising in northern Minnesota and meandering slowly southwards for 3,730 km (2,320 miles) before reaching the Mississippi River Delta at the Gulf of Mexico. With its many tributaries, the Mississippi’s watershed drains all or parts of 31 U.S. states and 2 Canadian provinces between the Rocky and Appalachian Mountains. It also borders and/or passes through the states of Minnesota, Wisconsin, Iowa, Illinois, Missouri, Kentucky, Tennessee, Arkansas, Mississippi, and Louisiana. The Mississippi River and its tributaries have a long history of significance to Native American cultures. Many nations lived along its river banks, most of which were hunters and gathers who used the river as a source of water and for transportation. But for some – such as the Mound builders – the river was key to the formation of prolific agricultural societies. The arrival of Europeans in the 1500s changed the native way of life drastically as first explorers, then settlers, ventured into the basin in increasing numbers and colonized the area. Initially a barrier between New Spain, New France, and the Thirteen Colonies, it grew to become a major artery of transportation and western expansion for the United States by the 19th century. Huang He, which is also known as the Yellow River because of the color of its silt, is the third longest river in Asia and the sixth longest river in the world. Located in China and measuring 5,464 kilometers (3,395 miles) in length, the river originates the Bayan Har Mountains in Qinghai province, western China. It then flows through nine provinces before emptying into the Bohai Sea near the city of Dongying in Shandong province. The Yellow River is also known as “the cradle of Chinese civilization” because of the pivotal role it played in the development of Chinese culture. Much like the Yangtze, the presence of human settlements dates back to the Paleolithic Era, and the fertile flood basins contributed to the rise of agricultural communities which eventually integrated with the less-developed settlements along the southern Yangtze. At 4,700 km (2,920 miles), the Congo River (aka. Zaire River) in Africa is the ninth longest river in the world. Interestingly enough, it is also its deepest – with measured depths exceeding 220 m (720 ft) – and the second largest river in the world in terms of discharge (after the Amazon). Originating deep in the eastern region of the Democratic Republic of Congo (DRC, formerly Zaire), the Congo is fed by the Lualaba river, which is itself fed by the Luyua and Luapula rivers that are connected to Lake Mweru and Lake Bangwelo. The river then runs west and constitutes much of the border between the DRC and its eastern neighbor, the Republic of Congo. The Congo river gets its name from the Kingdom of Kongo which was situated on the left banks of the river estuary. The kingdom is in turn named for its Bantu population, which were described in 17th century European records as Esikongo. The name Zaire is from a Portuguese adaptation of a Kikongo word nzere (“river”), a truncation of nzadi o nzere (“river swallowing rivers”). The river was known as Zaire during the 16th and 17th centuries, but the word Congo has since replaced Zaire gradually in English usage. However, references to Zahir or Zaire, as the name used by the natives (i.e. derived from Portuguese usage), has remained common throughout this same period. All the states that have existed in the region since attaining their independence from Belgium in 1960 – the DRC (which was named Zaire from 1971-1997) and the Republic of Congo – in turn derive their names from the river. And those are just some of the longest rivers in the world! 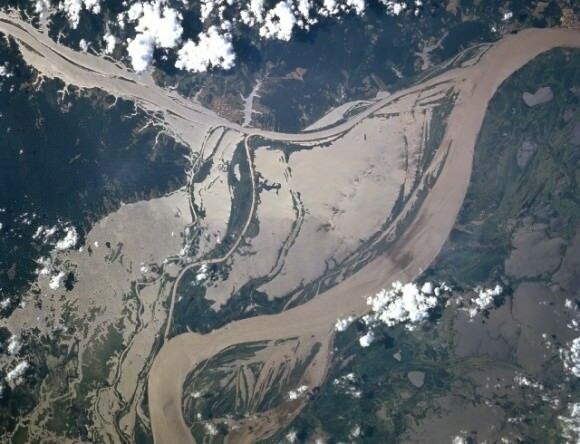 If you’re interested, Universe Today has many articles on rivers, such as what is the world’s widest river? For more information, check out longest rivers in the world and Amazon longer than the Nile. Astronomy Cast also has an episode on Earth which addresses rivers.